Home / Columnists/ Embrace tuition to empower teachers? Embrace tuition to empower teachers? Fifth of October was World Teacher Education Day as declared by the UN. The theme for 2015 is empowering teachers. In its joint communique with the ILO, UNESCO expresses its deep concern about the persisting challenges brought about by (1) teacher shortages and (2) the low status of teachers at all levels of education. Sri Lanka does not have a shortage of teachers. During the past decade our student to teacher ratios has been at a respectable at 18:1. However, lack of respect for teachers is a major issue in Sri Lanka. In this article I argue that dominance of skilled tuition masters outside of the school is a major reason for lowered status of teachers in Sri Lankan society today. I propose that we should decouple the school curriculum from the national examination content and allow teachers to ‘educate the whole child’ during school hours, with tuition providers teaching after school for ‘exam success’. A voucher system or similar should be in place to help the needy with the tuition costs. In Sri Lanka, teaching is seen as an easy place to park unemployed graduates irrespective of their suitability for teaching children. Politicians walk into school and threaten teachers. Education officials act like zamindaris. Worst of all, teachers who produce a few winners at public examinations are adulated while those who work to develop the whole child as expected of an educationist are ignored. Worst, tuition masters who are better at preparing students exam are revered above all. In a 2015 report titled ‘Rethinking education: towards a global common good,’ UNESCO reports that the latest trends show a continued de-professionalisation or a lack of recognition of teachers as professionals at all levels. The agency recommends that we “ensure that teachers and educators are empowered, adequately recruited, well-trained, professionally qualified, motivated and supported within well-resourced, efficient and effectively governed systems”. One cannot argue with these recommendations, but, how do we get there is the question. The report goes on to identify austerity measures and poor accountability as the overarching reasons for low status of teachers, but, ground reality suggest otherwise. Sadly, the analysis of UN in regard to the low status of teachers is off the mark. The aspirational definition of a school according to the 1996 Delors Report of UNESCO is a place where one learns “to know, to do, to be and to live together,” the four pillars of learning. Essentially the school is supposed to be a place where you develop the whole child, not just a place to impart knowledge and skills. However, as the 2015 UNESCO report notes “the four pillars of learning are fundamentally under threat in the context of current societal challenges, and particularly the pillars of learning to be and to live together, which best reflect the socialisation function of education”. The reasons are largely external, I believe, not financial or administrative, as UNESCO suggests. Schools and teachers function in an extremely competitive environment where every parent aspires for the best for their children and the best is measured by success at examinations. Private tuition providers are better at preparing children for exams. The UN or policy makers at the national level view tuition as a mere nuisance, but, it is a defining attribute of modern education. Examinations-driven education is not going to go away any time soon. In Finland and other European countries children may not be under pressure to perform at examinations, but, the reasons are deeply embedded in the socio-cultural values of those societies. The USA is struggling to incorporate standardised test to into its highly decentralised and unique form of education. Countries in Asia, in contrast, have embraced and thrived on examination-based education systems. 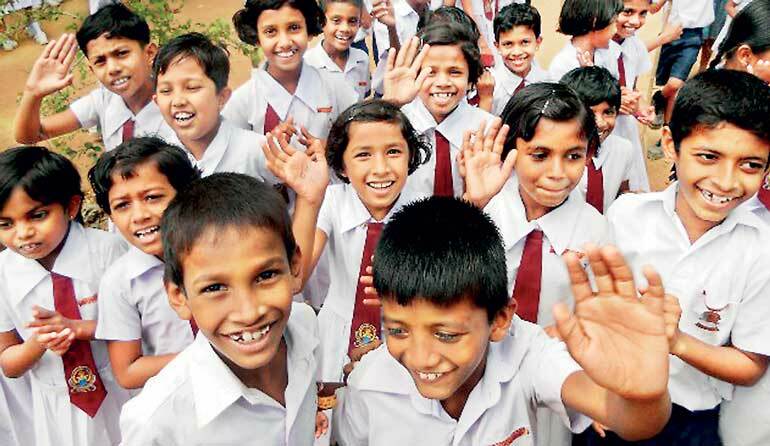 In Sri Lanka, the Central School system of the fifties was able to give a holistic education with exam success as one component. With increased participation of the population in schooling, public examinations have become more competitive and schools have slipped in their responsibility to educate the whole child in face of pressures to teach for exams. Teachers are not trained to teach for exams. Examinations today require intensive coaching to be provided by specialists. 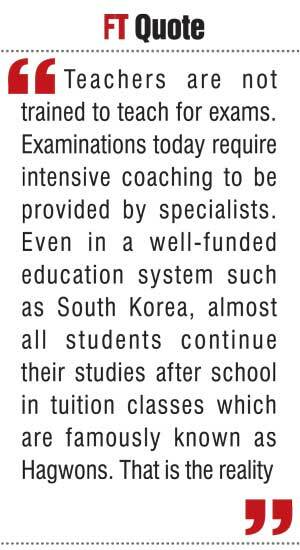 Even in a well-funded education system such as South Korea, almost all students continue their studies after school in tuition classes which are famously known as Hagwons. That is the reality. Tuition is viewed by parents as an evil necessity and by policymakers as a social ill to be eradicated. On the part of policymakers it is a losing battle. IN Korea, for example, education authorities have resigned themselves to the necessity of Hagwons and now focus on limiting their operations 10 p.m. However, there is still the wide-spread hope that better funding, better training etc. will make schools more competitive and parents will have no reason send their children to a second private session which essentially cover the same material in the school curriculum. Policy makers are hoping against hope, I believe. It is time to accept the reality that teaching for examination success and teaching to develop the whole child are two different objectives that cannot co-exist. Even with a school culture which is preoccupied with examinations, we still have 50% of so of our youth leaving school without a GCE (O/L) certificate. By all indications students fail the O/L because they do not have the basic reading and mathematical skills which should have been acquired in prior grades. What we need is a curriculum and a school-based assessment system that brings ALL the children up to a certain standard in regard to a basic knowledge and skills set (through learning to know and learning to do) and personal and citizen competencies (through learning to be and learning to live together). Currently the school curriculum covers an astounding breadth of material because they have to ‘cover’ the material required in the national examinations. The result is that those who pass the exams prove that they know a bunch of facts and those who fail have nothing to show for their time in school. The school curriculum needs to change from being extensive to intensive. School time should be devoted to going deep into selected topics where students learn through activities, labs and field trips so that students become critical thinkers, innovators and acquire other attributes which studying for exams do not give. Teaching for examinations would be an optional activity that is included after completing the core program during regular school hours. We already have such a system in practice, but children learn the same material twice. Children facing Grade 5, Grade 11 or Grade 13 typically rush to tuition classes to learn the same material they covered in school. What a waste? Why not do something different at school. Schools have the labs, playgrounds and more space than tuition providers. Why not use them by introducing an activity-based student centered curriculum which does not necessarily follow the examination syllabus? Teachers are empowered when they provide a service that others without their training could not. If the time at school is devoted to activity-based learning which are aimed to give the students a range personal and citizen competencies, it is an education which both families and society benefit in the long run. Performance measures will no longer be based on success of students at public examinations. The responsibility of the teacher would be to ensure that each and every child receives the basic knowledge, skills and attitudes needed to function in society. There are already methods to assess and reward teachers in that regard. More on that later. According to the Household Income and Expenditure survey, families already pocket out a significant amount of money for tuition. If after school tuition is recognised as being necessary for passing the national examinations, schools can provide top up classes for students. The teachers should be paid should be paid overtime for their services. Schools could combine their efforts to pick the best teachers to give after school tuition. If parents feel their children need to be more competitive they would be free to send their children to private tuition classes with the Government including a tuition subsidy for deserving parents. This way the whole education process will not be corrupted by an examination system where intense competition to get to the top has made intensive coaching an imperative.